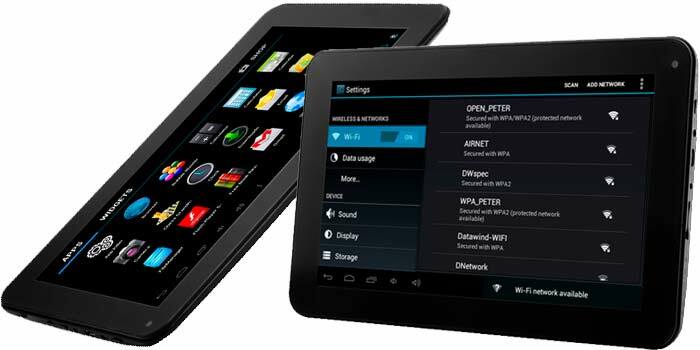 Datawind on Tuesday has launched India cheapest 10-inches tablet termed UbiSlate 10Ci and UbiSlate 3G10. Both the tablets has been exclusively launched with leading e-commerce website i.e. Snapdeal. The price against the tablet UbiSlate 10Ci is Rs. 5,999 and UbiSlate 3G10 has asking price of Rs.9,799. Both the tablets features sporting 10.1-inch display with pixel resolution of 1024 * 600. The RAM is of 1 GB with expandable storage upto 32 GB via. microSD card. Front facing camera is of 0.3 MP. While, battery accounts 6000 mAh capacity which supports 6-8 hours and comes in black variant only. Ubislate 10Ci runs on Android Kitkat v4.4.2 and powered by 1.1-GHz Cortex-A9 Dual-core processor. Internal memory is of 4 GB with rear camera of 2 MP. It has no Sim slot. Though, Ubislate 3G10 runs on Android Jelly Bean v4.2.2, embedded with 1.3-GHZ Cortex-A7 Dual-core processor. Primary camera is of 5 MP and Sim slot has been provided with 3G connectivity. Both the Tablets has Wi-Fi connectivity, Bluetooth, GPS and microUSB. Only difference between the tablets are Ubislate 3G10 has Sim slot with 3G connectivity when compared to Ubislate 10Ci. Ubislate in India is known for its cheap tablets and with the launch of Ubislate10Ci and Ubislate3G10 it is confirm that it has got the cheapest price label under 10-inches screen size. Talking about performance, Datawind tablets are on average position when compared on measuring scale. Datawind always try to establish trend and set apart from its competitors and in doing so they have succeed. When the Datawind brand arrives at customer ear, perception of better offering at low price is created of its own.